Rotifers are small (100-300 micron) zooplankton that exist in freshwater, brackish, and marine environments. Rotifers feed on microalgae and are consumed by a wide variety of fish, shellfish, corals, and other filter feeding organism. Rotifers are used extensively in aquaculture and aquariums because of their super high reproductive rates (doubling or better every 24 hours). 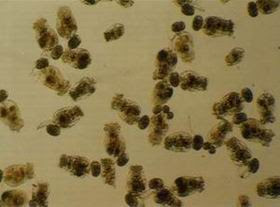 Under optimal conditions a rotifer culture will double in volume every day. The life span of a marine rotifer is 7 to 12 days. They have very high metabolisms and empty their guts and need to eat every 4 hours.